What better time than the holidays to share your big news? Need inspiration? Check out 10 Christmas pregnancy announcement ideas we love! While you can definitely find clever ways to announce your pregnancy any time of the year, there’s something extra magical about sharing the big news during the holiday season. Plus, let’s be honest, you have a lot more to work with in terms of coming up with the ultimate reveal! All you need is a little imagination and creativity! Need some ideas to get you started? Here are 10 that we absolutely love (plus a few more sprinkled in from Instagram that are just too sweet)! Facebook Pregnancy Announcement– Facebook is a great place to announce your pregnancy to the world (AFTER you’ve told your family and closest friends, of course). This digital file features the text- “We’re unwrapping our own little gift…Baby_______ is due ___________.” You can add a photo of your choice as well. These announcements can be found at Etsy. If you’re good with Photoshop or PicMonkey, you can easily make your own, too! Holiday Bottle Labels– Wine bottles are a great gift idea and they make an ideal way to announce your pregnancy. Just attach one of these wine labels to a bottle of wine that you plan on giving as a gift. These wine labels are available from Etsy. Mistletoe Photo– With just a mistletoe and the daddy-to-be, you can create a cool pregnancy announcement photo. There is no text needed, since the picture says it all. You can find an image of this idea here. 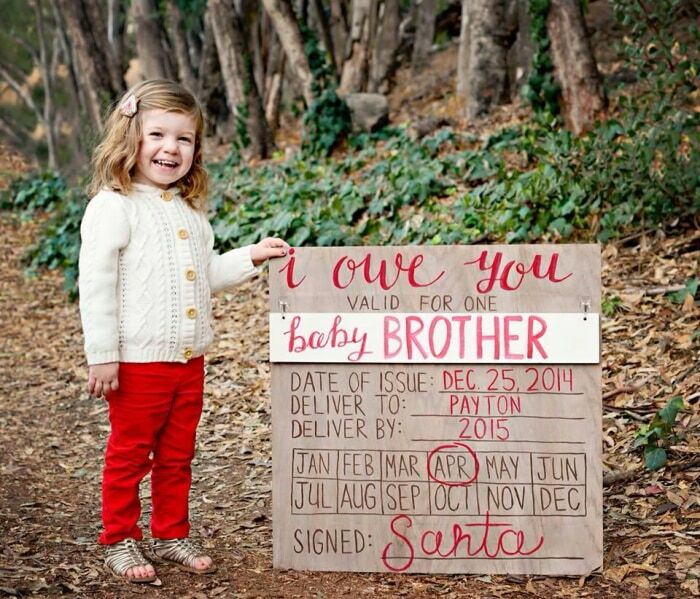 Santa IOU Photo– If you have an older child, you can get them involved in this pregnancy announcement idea. It is really easy to create this Santa IOU sign, one that he sent to your older child, of course. An image of this idea can be seen here. Snow Family Idea– Creating a snow family, then taking a photo of it, makes a unique pregnancy announcement idea. It is simple to do; just create miniature snow people for each member of your family, including the unborn baby. You can view an image of this idea here. Belly Baby Shirt– Wearing this “Belly Baby’s First Christmas” shirt to your holiday parties will have everyone asking questions for sure. It is a neat way to get your message across to everyone. These maternity shirts can be found at Etsy. Big Brother Dog Shirt– If you have a dog, this shirt is a creative way to announce your pregnancy. Have your dog wear this “Big Brother” shirt on Christmas Day and watch the reactions from all your visitors. You can find these dog shirts at Etsy. A fun big sister/pregnancy announcement during the Christmas season! This is a digital download in my Etsy shop. Baby Booties Ornament– These adorable ornaments are a great way to announce your pregnancy to family and friends. The glass ball ornament features a white pair of baby booties inside. You can find these ornaments at Etsy. Elves on a Shelf and Candy Canes Announcement– The Elf on a Shelf is a Christmas-themed doll that was featured in the 2005 picture book- The Elf on a Shelf: A Christmas Tradition- by Carol Aebersold and Chanda Bell. This pregnancy announcement idea is easy to make, since all you need is a pair of Elf on a Shelf, 2 large candy canes and 1 small candy cane. You can view an image of this announcement idea here. Pregnant Mrs. Claus Cake– Need a creative way to announce your pregnancy? Looking for a unique Christmas dinner dessert? Then a pregnant Mrs. Claus cake is your answer. If you are good at baking, you can make this yourself or a baker can create one for you. You can find an image of this cake here. With so many clever ways to tell your family and friends the big news, the hardest part is deciding which Christmas pregnancy announcement to go with! Which of these ideas do you love the most? Share below! These are all cool ideas! I like the idea of Holiday Bottle Labels. It would be fun to see that “surprise look” on everyoe’s face. Pregnancy is very important for every couple, and these Christmas pregnancy announcement ideas are so cute and exciting. I really love the concept of Facebook announcement idea. I am sure that Christmas would make it so special and so much fun. I love seeing all the pregnancy announcement ideas that couples and families have! These are awesome suggestions for people who would like to be more creative. Pregnancy announcement is something to look forward to and it was really great that nowadays people have that ideas. I love the concept of Big Brother Dog Shirt 🙂 everything nowadays is about to get a little crazier. All of these ideas are so cute and fun! I think announcing your pregnancy at Christmas would make it so special.